吴婕, 高学杰, 徐影, 等. 2018. RegCM4模式对雄安及周边区域气候变化的集合预估 [J]. 大气科学, 42(3): 696-705. Wu Jie, Gao Xuejie, Xu Ying, et al. 2018. 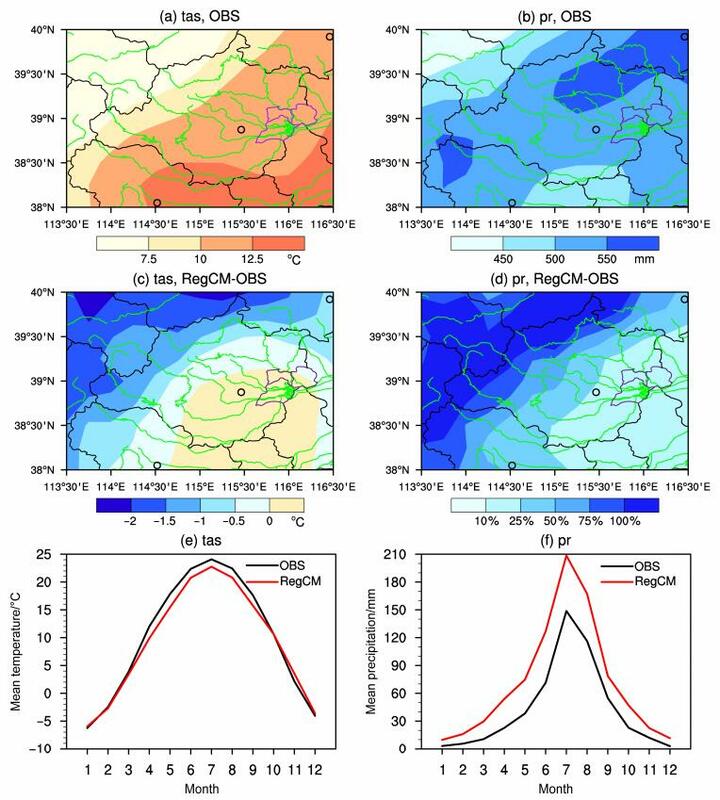 Climate Change Projection over Xiong'an District and Its Adjacent Areas: An Ensemble of RegCM4 Simulations [J]. 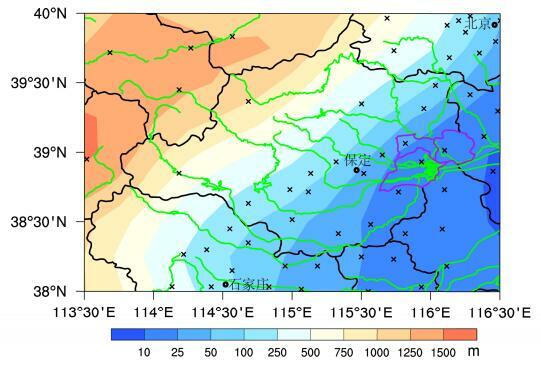 Chinese Journal of Atmospheric Sciences (in Chinese), 42(3): 696-705, doi:10.3878/j.issn.1006-9895.1712.17244. 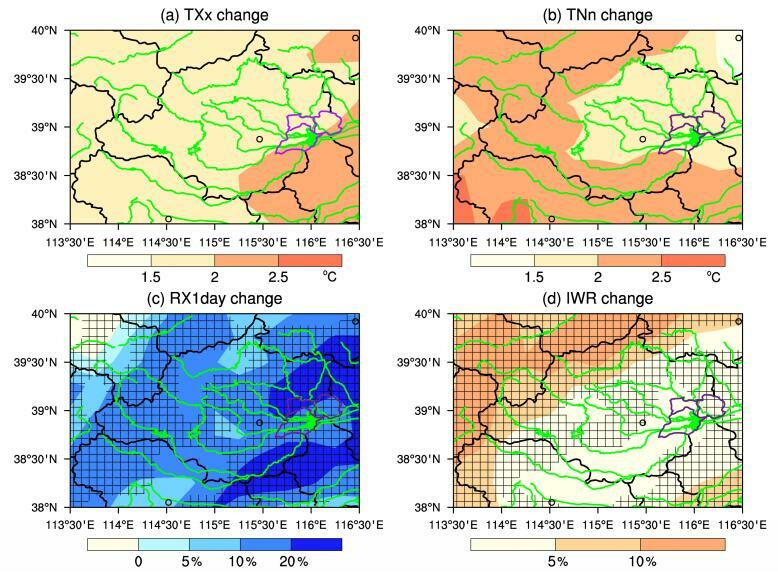 Abstract: We investigate the future climate changes in the 21st century in the Xiong'an District, recently established by the Chinese government, and its surrounding areas in North China based on 4 sets of RegCM4 climate change simulations over East Asia under the mid-range RCP4.5 (Representative Concentration Pathway) scenario. The model is run at a grid spacing of 25 km, and driven by the global model simulations of CSIRO-Mk3-6-0, EC-EARTH, HadGEM2-ES and MPI-ESM-MR, respectively. Validation of the present day (1986-2005) climate simulations is conducted first, followed by the ensemble projection of future changes along with the inter-simulation spread. Results show that the model can well capture both the spatial distributions of mean temperature and precipitation and their annual cycles. The model also shows a good performance in reproducing the temperature extreme indices of annual maximum value of daily maximum temperature (TXx) and annual minimum value of daily minimum temperature (TNn), and the precipitation extreme index of annual maximum 1-day precipitation (RX1day). 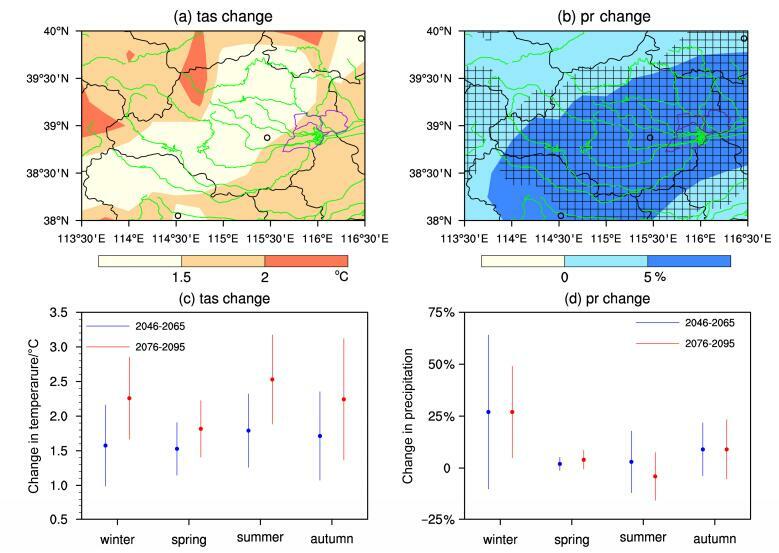 Continuous warming and increases of TXx and TNn are found over Xiong'an District and its adjacent areas in the 21st century, indicating a warmer climate condition and more frequent hot spells in the future. With slight increases in mean precipitation, significant increases in RX1day with small inter-simulation spread are projected, indicating the intensification of precipitation extremes and more floods over the region. In the meantime, the greater increase in potential evapotranspiration compared to precipitation following the warming will lead to increases in water stress. Dickinson R E, Henderson-Sellers A, Kennedy P J. 1993. Biosphere-atmosphere transfer scheme (BATS) version 1e as coupled to the NCAR Community Climate Model[R]. NCAR Techical Note, NCAR/TN-387+STR, 72pp. Giorgi F, Jones C, Asrar G R. 2009. Addressing climate information needs at the regional level:The CORDEX framework [J]. WMO Bulletin, 58(3): 175-183. IPCC. 2013. Climate Change 2013:The Physical Science Basis:Contribution of Working Group Ⅰ to the Fifth Assessment Report of the Intergovernmental Panel on Climate Change [M]. Cambridge, UK, New York, USA: Cambridge University Press: 1535pp. UNEP. 1992. World Atlas of Desertification [M]. London, UK: Edward Arnold: 69pp.